A malicious insider in a wireless network may carry out a number of devastating attacks without fear of retribution, since the messages it broadcasts are authenticated with valid credentials such as a digital signature. In attributing an attack message to its perpetrator by localizing the signal source, we can make no presumptions regarding the type of radio equipment used by a malicious transmitter, including the transmitting power utilized to carry out an exploit. 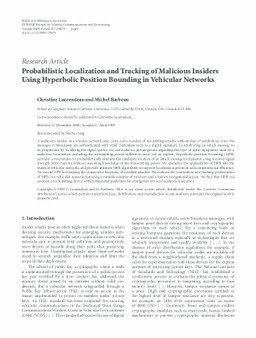 Hyperbolic position bounding (HPB) provides a mechanism to probabilistically estimate the candidate location of an attack message's originator using received signal strength (RSS) reports, without assuming knowledge of the transmitting power. We specialize the applicability of HPB into the realm of vehicular networks and provide alternate HPB algorithms to improve localization precision and computational efficiency. We extend HPB for tracking the consecutive locations of a mobile attacker. We evaluate the localization and tracking performance of HPB in a vehicular scenario featuring a variable number of receivers and a known navigational layout. We find that HPB can position a transmitting device within stipulated guidelines for emergency services localization accuracy.